The Dadbag Is Why We Don't Deserve Nice Things | OhGizmo! By Randy Donack on 09/26/17 • Leave a comment! Remember the fanny pack, fashion icon of the 1990’s that turned dads everywhere into walking storage shelves? Maybe I’m harsh, but I’d say it’s the worst thing ever. It’s essentially a purse with a plastic buckle that wraps around your waist. And much like the mullet, and acid washed jeans, the fanny pack died an undignified death, left in the middle of the streets as men everywhere realized at the exact same moment just how dorky they looked. 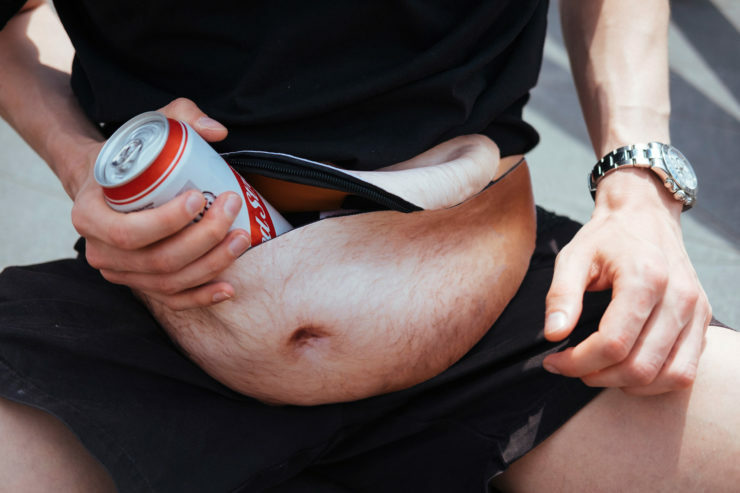 Well, now someone is trying to take the title of ‘worst product ever’ by combining that fanny pack with the look of a ‘dad gut’. It’s exactly as simple, and monstrous as it sounds, a fanny pack that protrudes out from under your shirt to make you look like a new dad. To be fair, if you’re into practicality, the Dadbag looks to have plenty of space to store your wallet, keys, phone and dignity with room to spare. It’s not available yet, but it’s creator Albert Pukies is looking for people to help put it into production.